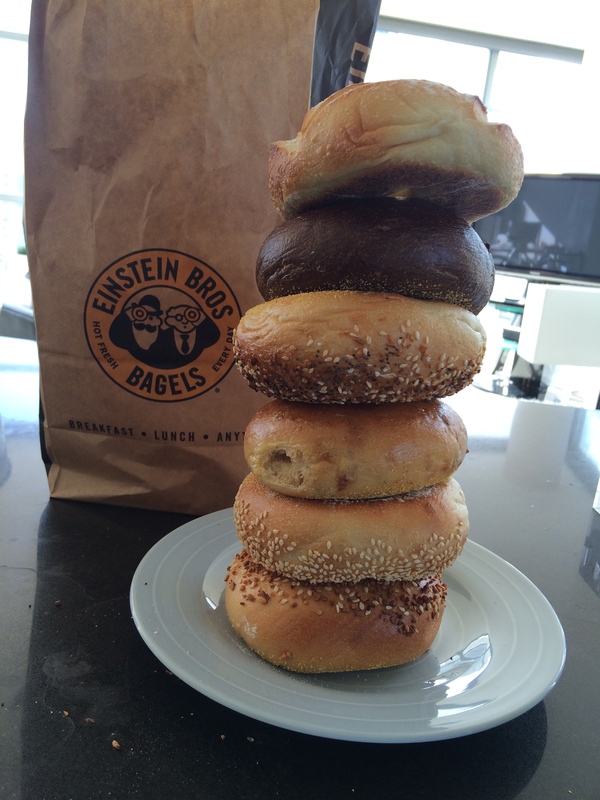 Perpetual thanks to Dr. William Davis for establishing the six bagel stack as a dietary icon. When I think of Wheat Belly, it’ll usually put me in the mood to pick up half a dozen bagels. They have a special at Einstein Brothers, where six bagels plus a half-pint of spread costs $9 USD. The bagels totaled to about 630g, so it’s a reasonable price. I was really hungry after back-to-back spin classes this morning, and I quickly finished four of the bagels. They were just-baked warm and delicious! I’ll save the last two for after dinner, which will probably be Taiwanese noodle soup again. Yes, if I eat a stack of bagels everyday, I’ll lose weight. It’s not magic, it’s just a low-fat diet.